At 4PM, I remember lying down in my bed, thinking that I will miss CNBLUE's concert. I'm just 3 train stations away from the venue and my boyfriend even offered to buy me a ticket. I refused because I already used up my 'concert ticket fund' when my sister forced me to buy VIP tickets for One OK Rock's Ambition in Manila. I also kept thinking that it will be sad if I only go to the concert by myself. I told my boyfriend that it's okay because I want to preserve CNBLUE in Budokan as my last concert before the boys enlist to the military. Thirty minutes later, I received a Viber message from my colleague Gigi and she's offering her extra VIP tickets for me and my sister! After panicking, I finally sorted out how my sister can pick up the tickets from Gigi and I was able to TMI take a bath and get dressed. It was rush hour on a Saturday so my supportive boyfriend helped me book Uber to no avail. We decided to ride a bus with less than an hour before the concert, I can't even remember the last time I rode a bus! We arrived 5 minutes after 6PM but I knew that the concert will start on a later time. True enough, it started at 6:30PM and I still had time to go to the bathroom and buy drinks. Chino was kind enough to stay in one of the bars in Cubao Expo, I wouldn't torture him into attending a Korean band's concert, even if it's my favorite band! They started with "Radio" my favorite Japanese track and sang my all time jams I'm Sorry, Can't Stop, Cinderella, Coffee Shop, In My Head, Domino, Love Girl, Blind Love, You're so Fine, Wake Up and the anthemic the anthemic "Young Forever. I also enjoyed the new songs from 7 degrees CN, their latest Korean album, "When I was Young", "It's You' and "Between Us", are daebak live! 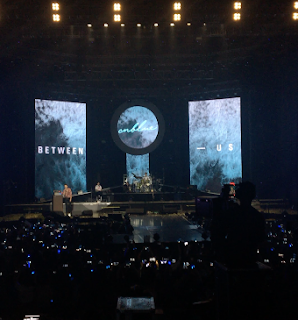 It was a memorable concert, from seeing the boys go touristy in Cubao the night before the concert, the free tickets to beating the Saturday traffic to go to Araneta, the stage that let the boys interact with the fans, effort sa lighting and more importantly CNBLUE's solid live performance. To my disappointment, someone even taught them Tagalog words like "petmalu", "I am your lodi" and "Ang init"! Kings of fan service!